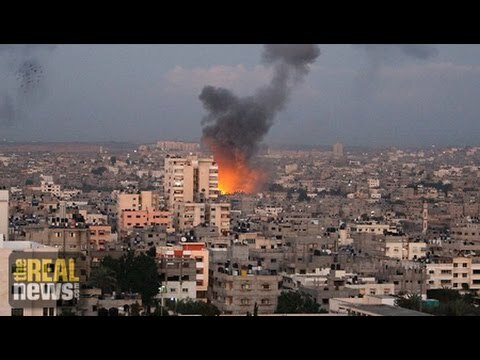 BILL FLETCHER JR., HOST, THE GLOBAL AFRICAN: The brutal Israeli assault on Gaza has generated immense devastation for the Palestinians. As Palestinians watch in horror as their very society crumbles around them, most African-American churches and mainstream black organizations refuse to issue any public condemnation of the Israeli assault. FLETCHER: The national office of the NAACP, which was contacted for this story, acknowledged that no public statement of any kind has been issued by the organization, even after a recent annual convention in Las Vegas, Nevada. The National Urban League, another prominent civil rights organization, has remained silent as well. When contacted for the story, a spokesperson for the Congressional Black Caucus pointed to a statement issued by its members calling for a ceasefire, effectively echoing the official United States position. Martin Luther King once said, injustice anywhere is a threat to justice everywhere. But mainstream organizations in the black community do not seem to adopt that maxim when it comes to the current Palestinian crisis. Today on The Global African, we’ll discuss the ramifications of the silence and the larger message that it sends about who’s fighting for justice in this country today. Now joining us is Rev. Heber Brown, who is the pastor of Pleasant Hope Baptist Church in Baltimore, Maryland, founding editor of Orita’s Cross, and is in himself a humanitarian and social activist. REV. HEBER BROWN III, PASTOR AND ACTIVIST: Thank you so much for having me. FLETCHER: You’ve watched the pictures of Gaza. What does it make you feel? BROWN: I worry and I wonder and I pray for those who I’ve personally met who are living under occupation and, right now, under this nightmare of the military incursion into Gaza. FLETCHER: Now, within black America, there’s a historical split on the issue of Israel and Palestine. For many years, beginning with the creation of the state of Israel, it was sort of accepted that you supported this unconditionally. Then, after the Six-Day War, there was a shift, and more African-Americans began speaking out, raising questions about Palestine. In the current crisis, I hear very little coming out of mainstream black America. BROWN: Yeah. I think it’s very unfortunate that these organizations that so many not in our society have looked to over the years as credible sources for human rights and rights for African-Americans are silent on this issue. I think for me a part of the reason–my hunch is that it comes down to the relationships that these groups have with foundations and funders that may have politics that are favorable to Israel. And if, for example, your conference or your summit or institute is being funded by a foundation that has a pretty conservative stance on the issue of Palestine and Israel, then it’s going to make you at least a little bit hesitant before you speak out. FLETCHER: So that responds to the question of the mainstream black organizations. But there’s also a separate question about what’s going on in the black church. And so the Presbyterians voted in favor of divestment, but you don’t hear about that sort of motion within the black church. As a pastor, how do you explain this? BROWN: Yeah. I think part of it is ignorance. There’s, I think–and it’s not just for the church. I think–and this is a generalization, but Americans don’t tend to be as sensitive to foreign policy issues until there’s some major crisis, and then we start paying attention. But we pay attention absent of context. And so we cry out or we speak out because of the urgent emergency, but we don’t tend to be a nation that is as engaged in world affairs as other nations are. So I think ignorance is a part of that. And that ignorance flows into the church. I think the other side of the coin, too, as a pastor, I’d say I’ve witnessed just bad theology, just plain bad theology around Israel. There’s a theology that says that Israel is promised land for a chosen people, and so Jews, because they’re chosen of God, have divine right to this land. And this bad theology lives in far too many black churches in particular. And that silences many churches or makes churches vocal in support of what I deem to be racist views against Palestinians. FLETCHER: I was going to ask you about the issue of Christian Zionism in specific. Is that something that you find yourself engaged in struggling? BROWN: Definitely. People like John Hagee, who is a televangelist and pastor, started this organization called Christians United for Israel, which is a Christian Zionist organization. And not only do they have inroads into the white evangelical church community, but they have worked to build bridges to the black churches as well. And so a few years ago they hired, for example, an African-American pastor to be their liaison to the black church community. He went around touting the talking points of Israel and the occupation. And then, also, they’ll throw money together with their partners to send black pastors on what they call holy land tours. And they send pastors over there to go around Israel to say, here’s where Jesus prayed. FLETCHER: Theologically, how do you respond when you hear someone say something like, well, this is supposed to be the promised land, this is supposed to the Jews’ land, Palestinians are interlopers, or something? How do you respond to that? BROWN: Well, personally, I do not equate biblical Israel to the modern nation state of Israel. And so when people just do history and just look at the events of the ’40s and the ’60s with the creation of the current modern nation-state of Israel, you have to consider that in addition to whatever your theology is around the Bible and what the scriptures say. The scriptures don’t talk about dinosaurs, but you won’t find a black Christian nowhere who will say, well, the Bible don’t say it, and so I don’t believe in dinosaurs. No. We’re able to, as thinking people of faith, lay out Scriptures right next to what we know of modern history and then make an informed assessment about how we understand and engage the world in which we live. I wish more black Christians and black pastors would keep their Bibles, but lay it next to historical facts related to the Palestinians and related to Israel, and then make informed discussions not just based on a biblical telling of history, because we don’t do that in many other areas of our lives; as thinking people of faith, we don’t. FLETCHER: Let’s look at another angle, in terms of the issue of why we’re not hearing more from within black America. When, for example, SNCC, the Student Nonviolent Nonviolent Coordinating Committee, issued its statement in 1967, it was demonized. And among the charges was that of anti-Semitism. And within the domestic situation, there are tensions that have–. We have a complicated relationship with Jews. And do you think that this complicated relationship with Jews that includes allegations that African-Americans are anti-Semitic, do you think that that leads to people to be reluctant to make criticisms of Israel? Or do you think that that’s not a factor in what we’re seeing? BROWN: Yeah, I definitely think it is a factor, that no one wants to be called anti-Semitic. And that is the reflex charge to many of those who speak out against what the Israeli government and the Israeli military is doing. And so that is going to make people think twice, ’cause you don’t want to be labeled–nobody wants to be labeled racist, you don’t want to be labeled bigot, you don’t want to be homophobe, or–no one wants any of those labels. They don’t think of themselves in that way. And so that is a factor, I believe, that they don’t want to be called anti-Semitic. And I think you’re right as well that it is a complicated relationship between many African Americans and Jews. But isn’t that the nature of all relationships? I don’t know about your family, but we’ve got some complicated relationships in my own family. And sometimes even in my own family we have to call each other to the carpet and hold each other accountable, not in the spirit of hatred or destruction. By God, no. It is to help encourage one another so that we might strengthen the bonds of that relationship. So that’s what I would say to people who are concerned about the relationship between Jews and African-Americans, that if there’s charges of anti-Semitism, I would say hold on, slow down. If we call right right and wrong wrong, that does not by its essence mean that we’re working for your destruction or that we hate you. It might mean we care about you and we want you to live up to the best of the virtues, values, and traditions that we know are found within the Jewish community, within Judaism proper. And so I think there’s some work to do there. When we conflate these terms and when these criticisms just become just reflex, I think it’s problematic, because in every relationship you have some conflict. And I can also say this, that for those who would say that African-Americans are anti-Semitic when they make criticisms of the Israeli government and the Israeli military, it is based on this false premise that all Jews think the same and believe the same on this issue. I know that and you know that to be patently false, that there are so many courageous Jews who are standing up, speaking up, and facing immense ridicule from their own community because they’re saying, you cannot do this in my name, this is not the best of Judaism, you are besmirching what is the beauty of our culture and our people. And so for those who are charged, me, you, or whoever else, with being anti-Semitic and just being against Jewish people, I would remind them that there are Jews right now laying their bodies on the line to make sure that there’s justice, justice and peace in Palestine-Israel, and we offend their witness when we try to lump all Jews together. There is no people on the face of the planet who all believe the exact same thing on everything. And so I think we need to help people to see that and to be sensitive to that. If I’m anti-somatic, that’s news to me, because just less than 24 hours ago, I was marching in the streets of Baltimore City, Maryland, with Jews in Baltimore who were saying, “Not in my name”, “Free Palestine”. They were chanting, Jews were chanting, “Resistance is justified when occupation continues”. And so these chants and these beliefs, there’s a rich and vibrant spirit for justice and peace within the Jewish community with standing up on this issue. And I just choose not to offend their courageous witness by believing that they all think the same. FLETCHER: The other day I had a discussion with an elected official–and very progressive person, including on this issue of Palestine, takes what is called a very balanced view. But one of the things that they said to me was that they were very fearful of speaking up on this, because they would face political pushback. In fact, this person is running against somebody in the November elections who is charging that they’re insufficiently supportive of Israel. So when we’re in a situation where we’re trying to win elections, where does this issue of–what do we say, for example, to Democrats who may be very good on a number of issues, but when it comes to Israel and Palestine are lockstep with the Israeli government and with AIPAC? What do we say to them? BROWN: Yeah, that’s a good question. It’s a hard one, because it almost seems like there’s a checklist, right? BROWN: If you want to get elected, here are some things you’ve got to do. You’ve got to work on your image, you’ve got to work on–you know, they’ve got this long list. And somewhere on that list is you have to be vocal about supporting the Israeli military and Israeli government in the occupation of Palestine. So it’s a tough question. And I think it gets that much more difficult to answer the higher you go in electoral politics. And so on the federal level, of course, I think it becomes even more difficult than it would be on local elections when communities can better surround and come to protect those who want to speak out for justice and righteousness, as I call it. So I would say I would start with the local politicians and start real early, because the dynamic is that not only do you have to have the, the quote-unquote, right views on issues, but you also have to have money to win elections. I mean, that’s the prevailing thought and wisdom. And so, Mr. Fletcher, when we think about the ways that this issue connects back home for black folk–we were talking about black people. And so one of the things that I say see as a hurdle for black people is that for some, they don’t see the relevance, they don’t see, how does this matter to me, how does this connect with my community. I mean, I’m dealing with lead in the water in my community, I’m dealing with poor schools, I’m dealing with high unemployment. How does this connect? And so it was helpful for me when I went to Palestine-Israel and I saw for myself the kinship between the oppression faced by African-Americans and the occupation faced by Palestinians, kinship, not only historically, but even modern-day. And so, for example, in cities like Detroit, Baltimore, and the rest, they have technology that’s used to conduct surveillance on black and poor communities. Some of that same technology, and in some cases some of the same companies, are involved in the surveillance of Palestinians as well. There is a direct connection there. Black folk in Detroit and in Newark are upset about having these cameras all in their communities, but of course not downtown in the posh communities. Palestinians are upset as well. Their movement is being restricted by checkpoints and the like. And so there is a kinship right there, there is a kinship when we talk about jobs that are available to some people and not all people. There’s kinship in terms of the discriminatory laws. And so I think the more we connect those dots and the more we point out the hypocrisy–. So President Obama, for example, pulls out the talking point that many of the elected officials will say, Israel has a right to defend itself, but Marissa Alexander is facing 60 years in prison right now because she dared to try to defend herself. BROWN: And so the more we make those connections when we think about Emmett Till and we think about the young Emmett Till and Trayvon Martin and Jordan Davis and Renisha McBride and we think about the young people of Palestine playing soccer on the beach or being lynched in the occupied West Bank and the like, there is a lot of connection there. I am hopeful that with continued pressing and organizing, particularly between Palestinians, African-Americans, and courageous Jews, who are in this fight as well, the stronger our coalition can become to put pressure on elected officials just like AIPAC and other groups do. FLETCHER: Reverend Brown, thank you very much for joining us today on The Global African. BROWN: Thank you so much. I appreciate the opportunity. FLETCHER: And thanks for joining us. And we’ll be back in a moment. FLETCHER: Joining us today for a discussion on this entire question is Rev. Michael Livingston. Rev. Livingston is the former president of the National Council of Churches, former executive director of the International Council of Community Churches, current director of national public policy of Interfaith Worker Justice. He is a social activist, humanitarian. Thank you very much, Rev. Livingston, for joining us. REV. MICHAEL LIVINGSTON, DIR. NATIONAL PUBLIC POLICY, INTERFAITH WORKER JUSTICE: I’m very happy to be with you this afternoon. Thank you for the invitation. FLETCHER: I was trying to figure out how to begin this interview, but let me just come straight to this question. With all of the issues that are facing black America, why should people give a damn about Palestine? LIVINGSTON: Because in the church especially, we believe in one common humanity. We’re all created in the image of God. What affects one of us affects all of us, and it doesn’t matter where it happens. So there ought to be a deep concern on the part of any Christian, certainly, but I would say any person of faith, when devastating circumstances like this exist in even a distant part of the world. FLETCHER: So, then, how would you explain or what would you say see as the source of the problem in black churches with regard to raising this issue and having people speaking out? I mean, we have, by way of contrast, the Presbyterian Church, which as you know just recently voted to support that divestiture, but you don’t hear of that very much coming out of the African-American church. What’s your take on that? LIVINGSTON: I think it’s there just isn’t enough knowledge, and perhaps even interest, in looking at this. And I wish that were not the case. There are some small signs of change here, but historically we’ve been so engaged, in the African-American church, with the problems of the black community that to try to engage ourselves in international issues has proven so far to be beyond our ability to focus. FLETCHER: Although keep in mind we spearheaded the anti-apartheid struggle in the United States. African-Americans were very involved in the anti-Vietnam War movement. I mean, we actually have a history of engagement on international issues. It’s strikes me, though, that there’s this relative level of silence when it comes to Palestine. LIVINGSTON: I think what those two have in common that you just mentioned is, one, of course, we’re talking about blacks in Africa, and there’s a strong kinship there. The Vietnam War, I think there the common denominator was the high proportion of African-Americans who were drafted to fight in that war. So it was very much a central concern of our community. Palestine, Muslims, Arabs, we haven’t historically felt, at least in this period, that same kind of connection. And, again, I lament that. I regret it. If you don’t pay attention to it, if you don’t educate yourself, and you only are subjected to the kinds of mainstream responses and analysis that you get in our media, and, of course, from Jewish organizations which are intent upon telling their story in the United States, it’s hard to get that deeper, more pervasive understanding of the roots of that conflict and why it persists today. FLETCHER: Rev. Livingston, let me ask you this. I visited the occupied Palestine twice, and I was struck by the conditions faced by the Palestinians. The issue of apartheid, the issue of Jim Crow immediately jumped out at me. And I was curious how you felt in your visits. Did you have a similar reaction? Did you feel that the circumstances mirrored the African experience at all? LIVINGSTON: Even more immediately, my daughter just returned from Israel about a week ago, and both in her post while she was there, on Facebook and social media, and since she’s been back, she was profoundly affected by this and felt deep similarities in our experience here and what the Palestinian population has to deal with there, going through those barriers and the physical segregation that exists there. It’s stunning how similar it is to what blacks experienced here. That’s one of the reasons why I think it’s so important for us to be more engaged in this and to raise our voices, along with others, in trying to address that situation. But absolutely I think those parallels are felt because they’re real. FLETCHER: Indeed. When you watch the pictures that we’re seeing now from Gaza, how does it make you feel? What’s your reaction? LIVINGSTON: It’s devastating, it’s sickening, because of the very current reality of the destruction and the devastation and the loss of human life, including and especially children, but all life there, and also because there’s the sense that it’s a drama that just keeps repeating itself and that the big pieces that have to be shifted in a deep and profound way in order to bring some real change there are not moving, and especially, of course, the United States. We have such a profound ability to affect what’s going on there, to influence it, and yet beyond just talking about it, we just don’t seem to be exercising any of that muscle. FLETCHER: But you and I, we’re watching this, we’re having a very similar reaction. How do you understand the fact that there are many other people looking at exactly the same pictures and having an entirely different reaction? LIVINGSTON: It’s media, it’s education, it’s the relentless drumbeat of one narrative to the exclusion of the other, so that when people see this or hear about it, they think the things they’ve been taught to think. And if they don’t extend themselves, if they don’t read wider sources, if they don’t listen to broader sources, like this program, for example, if they don’t travel themselves or get in touch with people who have traveled, if they don’t invite into their own circles people who have perspectives which are different from the dominant narrative in our culture, they never move and they see the same thing, and they don’t get engaged in this in a way that will help to shift the balance of influence, and eventually power, so that we intervene there like people who really do want to see peace happen to everybody involved there. FLETCHER: Rev. Michael Livingston, thank you very much for taking this time to spend with us. LIVINGSTON: Thank you very much, Bill. It’s been a pleasure to be a part of this experience with you. FLETCHER: And thank you for very much for joining us on The Global African. I’m your host, Bill Fletcher.